2014. Pilot project TCFT in United Kingdom coordinated by Opera Circus UK, led by Tina Elen Lee, gathered experts and young people from partner organisations from Serbia, Romania, Bosnia and Hercegovina. The goal was to establish intercultural network of youth leaders which will get an opportunity to use non formal education in areas of art and culture. Youth with their cultural differences on the one side, and experiences on the other, influence the improvement of Commnuity Art project by planning activities, realisation and evaluation. Teatar Mimart is partner organisation from Serbia in project TCFT, represented by Nela Antonović. Group Leader for youth from Serbia is Lidija Antonović and this first year young participants were Anja Nikolić, Nina Petrov, Tanja Damjanovski and Tamara Rakić. Workshops enabled for young people to creatively express themselves, present themselves and express their opinions towards democracy, situation in the world and position of youth in society. They developed techniques of applying non formal education for employment in areas of art and culture. They went through training courses of production, organisation and fundraising for festivals, manifestations in culture and cultural events. 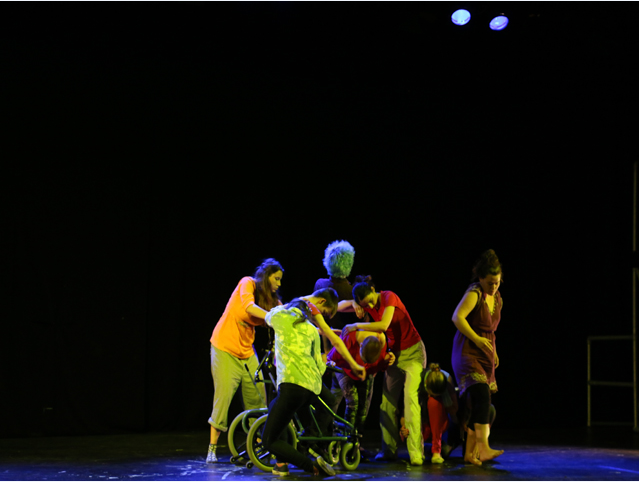 Final presentation of two weeks workshops took place in Bryanston Public School, where Nela Antonović through inclusive workshops and Mimart method directed a performance Clouds. Through evaluation we created a plan for future activities within project and defined main meetings, youth exchanges and festivals. In the end youth received certificates TCFT for non formal education Youth pass for Mimart leaders. 2015. All participants applied gained knowledge for their personal development, for work within Mimart, as well as their further work with children and youth in their local environments. We educated successfully over 50 young people from Serbia with Mimart method. Lidija Antonović participated a partners meeting in May in Srebrenica, as well as preparing activities and workshops for August in Bosnia: Srebrenica, Višegrad and Jelah. Lidija led photography workshops in Višegrad, and the presentation took place in Andrić-city. Anja Nikolić led dance workshops for children and youth in Jelah, while her experiese is contemporary dance in Belgrade. Other participants were Nina Petrov, Teodora Sarić, Katarina Orlandić and Lara Popović. They received certificates TCFT for non formal education Youth pass for Mimart leaders. Through Community art of artists, experts and youth from 16-26 y.o. during two weeks of workshops based on the topic of freedom, a festival was organized in public spaces of Srebrenica. Nela Antonović led workshops one on one about Art activist and street performance, as well as inclusive workshops with disabled children. This educational exchange participated 152 participants, 12 partner organisations from 7 countries, as Italy, Portugal and Georgia joined. Same year Nina Petrov participated World Forum for Democracy in Strasbourg as a youth representative from Serbia, while others continued their work with youth of Mimart. 2016. TCFT during 2016. Project kickstarted within all planned activities of exchange, application of gained knowledge, employment and project development. Youth from Serbia went through training courses in August of new fields 3D animation and animated movie, street activism, drama and dance, poetry, music and political position towards migrations, Brexit and EU integrations. Besides artists Nela and Lidija Antonović participants from Serbia were Saša Dobrohotov, Nina Petrov member of TCFT youth organisation board, Katarina Orlandić and Lara Popović. Community art through process of participation and two weeks workshops resulted with a festival of multimedia art in Bournemouth University in UK. Nela Antonović led workshops of performance in public spaces, and for presentation she prepared with youth from 7 countries a performance The Wall. Young people from Serbia were distinguished for their many talents and creative potentials. Youth exchange between Serbia and UK was important to reflect their creative and organisational abilities and application of their gained knowledge. Exchange in September-Group from Serbia: Nina Petrov, Anja Nikolić, Teodora Sarić and Rade Obradović worked as voluntaires at festivals, performed and led inclusive workshops in Dorset. Exchange in October -Group of youth from Dorset participated workshops of Mimart method and at a autoperformance festival SPOT TCFT, whish was organised by Teatar Mimart for the fourth time. 2017. Project Erasmus + ended in April 2017, so collaboration was intensive in the begining of the year. In the begining of February a partners meeting was held in Bridport, UK, where Nina Petrov from Mimart participated. Cultural exchange between Serbia and UK continued in March, when four artists Billy Read, Brian Kavanagh, Rachael Veazey and Alex Gichohi spent seven days in Belgrade. At two weeks residency in Tuscany TCFT Sarteano 2017, participated youth leaders from Serbia: Lidija Antonović, Anja Nikolić and Nina Petrov, as well as three young artists Mina Nikolić, Katarina Bućić and Saša Dobrohotov.